New Phone: to Buy or Not to Buy? For smartphones and other electronics, the best way to ensure your next phone does not contribute to worker abuse is to buy a used or refurbished phone. Before you make the choice to buy though, you may try to fix the phone you have (if broken) or simply pledge not to upgrade needlessly. Phone manufacturers and service providers like to encourage customers to upgrade their devices at least every year, but phones can in fact work for much longer. We put together a flow chart to help you choose your next phone. iFixit is also a great resource to learn how to repair your electronics and order needed parts. There are many vendors out there for used or factory refurbished phones, which help to divert phones from ending up in landfills. 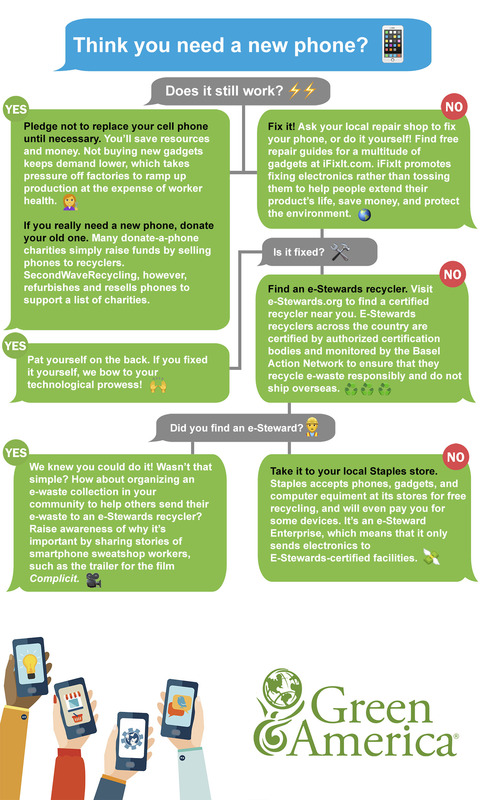 If and when your phone does stop working, recycle it with an e-Stewards recycler. e-Stewards recyclers are certified monitored by the nonprofit Basel Action Network to ensure that they recycle e-waste responsibly and do not ship it overseas where workers in scrapyards are exposed to dangerous work with without protection. Green Americans know that when we make purchases we are voting with our dollars, and we want to know that our spending does not finance unsafe working conditions or unfair treatment. By pledging to fix your phone, not upgrading, or buying a new phone, you are helping to curb the ever-growing demand for new, exploitative phones. Do you have any other tips for choosing electronics responsibly?